The 26th Annual South East Clare Show is scheduled for Sunday, July 10th at Bridgetown Show grounds Co. Clare; only 15 minutes drive from Limerick. A guaranteed enjoyable day out for families and friends. A perfect Summer evening on Friday last encouraged a great turnout of the local community & Show sponsors Citroën Dealerships in Co. Clare, O’Sullivan & Hansbury Ltd based in Ennis, and Co. Limerick, Clareview Car Sales located on the Ennis Road to participate in the South East Clare Show Launch. Miss Limerick 2016, Aoife McNamara was also in attendance for the photo opportunities on the evening. South East Clare Show has chosen Milford Care Centre as charity of choice for the Show date, Sunday, July 10th . Sr. Phyllis Donlon & Cathy Sheehan, was present to represent Milford Care Centre. Sponsor of the All Ireland Filly Championship on Show Day, Orchard Equestrian Ltd, was also represented . The 26th Annual South East Clare Show at Bridgetown Show grounds introduces some additional activity for families, children and patrons both in the leisure and competitive capacity. Be greeted on arrival to the show by the Garda Mounted Unit! With a total prize fund of €20,000 and more than 2,500 equestrian, cattle and Horticultural entries expected, the 2016 Show will draw thousands of people to watch feature classes such as Cavan Equestrian Centre Elite Sales Qualifier & Millstreet Qualifier 2016 for young horses, Champion of Champions in the Limousin Pedigree Cattle Section. The South East Clare Show is chosen venue to host this year’s All- Ireland Yearling Filly Championship in the Horse Showing section, attracting pre qualified entrants and enthusiasts nationwide. The Show will have something for everyone, including a comprehensive programme of children’s entertainment including bouncy castles, mobile pet farm and many dog showing classes- perfect for the family pet. A Magic show from 2pm – 3pm and free face painting will be available for the children . year including live cooking, local produce and gift ideas. Be in with a chance to win Best Dressed Lady- this year has an amazing 1st prize from The Otto Clinic, Limerick, win an amazing treatment from the leading experts in Munster for skin rejuvenation. Bring the family along with a chance to enter in the Bonnie Baby or little Miss Competition at 2pm. This year has also introduced a fashion competition for the expectant Mummy! A selection of Vintage cars & tractors will be on display. East Clare Harriers Hunt will be parading the hounds at 3pm in the main jumping arena; do not miss the beautiful spectacle and selection of two and four wheel traditional driving carriages and horses. 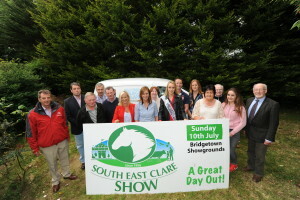 South East Clare Show has chosen Milford Care Centre as charity of choice for the Show date, Sunday, July 10th. The Show Committee look forward to presenting a donation post Show date into this community which touches the hearts of so many people.